Scientist from 24 countries gathered in Kiel to exchange ideas on ocean governance and sustainability. Kiel under the banner of sustainability. The Ocean Sustainability Science Symposium attracted speakers, contributors and participants from a broad variety of disciplines to take part in a three day quest for answers to tomorrows fundamental questions. Both early career scientist as established experts were given the opportunity to exchange their views on ocean sustainability, ocean conservation, ocean resources, ocean governance and outreach & arts. The Atlantic Hotel offered an ideal setting for the approx. 150 scientist gathering in Kiel from the 3rd to 6th of March. With participants from 24 different countries both the Geomar Helmholtz Institute for Ocean Research as also the “Future Ocean” Cluster of Excellence who organized the symposium proofed as credible institutions when it comes to interdisciplinary scientific exchange and modern thinking. 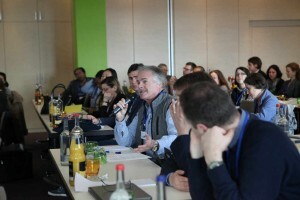 From plenary review lectures in the morning to topical workshops in the afternoon and lively poster sessions the symposium provided diverse opportunities for exchange among the participants, socialising and networking. The concluding plenary review on Thursday night was used to award the best posters entered in the early career scientist poster competition. The smiling winners came from Romania and the Netherlands and made perfect examples of how broad the spectrum of gathered scientist really was. As Natasa Vaidianu’s Poster stressed the Romanian struggle of stakeholder perception in the Black Sea coastal management, Kornelia Dimitrova’s Poster delivered an interdisciplinary approach to overcoming societal and environmental hurdles build up by climate change. Being influenced by architecture Dimitrova presented an artificial mussels farm capable of both empowering developing regions as also reducing eutrophication. “As long as we manage to understand problems as opportunities for new ideas and approaches we can win the race against time in order to counteract climate change”, said the young women. After three days of extensive talk and exchange, speaker of the “Future Ocean”-Cluster Martin Visbeck was satisfied with the general outcome of the conference. Yet Visbeck repeatedly stressed that sophisticated science in order to be effective needed a properly resourced world ocean assessment in order to implement the findings gathered during such conferences. This entry was tagged Future Ocean, geomar, marine sciences, ocean sustainability science symposium, social sciences, sustainablitiy.